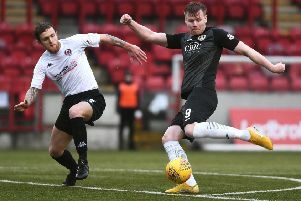 Edinburgh City will do everything they can to prove their doubters wrong and win Ladbrokes League Two, insists midfielder Marc Laird. With pre-season favourites Peterhead having assumed top spot with victory over Cowdenbeath seven days ago – the two sides meet again at Central Park tonight – it is being touted that the Blue Toon will now go on to lift the silverware in a couple of months’ time. Despite spending the majority of the season top of the pack – Saturday’s 1-0 defeat to Clyde saw James McDonaugh’s men slip to third in the table – City are now a point behind the Bully Wee and five adrift of Peterhead. However, the Capital side have the opportunity to leapfrog Clyde when struggling Berwick Rangers are the visitors to Ainslie Park tonight, a match Laird says they must emerge with all three points from if they are to keep their title hopes alive. Asked if the hype surrounding rivals Peterhead has been a bone of contention this season, 33-year-old Laird said: “I don’t take much notice of what other people are saying to be honest. We just need to focus on ourselves as what will be will be. If Peterhead have got the biggest budget then fine. They’re top of the league and deserve to be there right now. They play Cowdenbeath tonight so who knows how that one will go. “All we can do is trying to get back to what we were like at the beginning of the season. Clyde are on a fantastic run of 16 games unbeaten so you’ve got to give them credit as they’ve come right back into it. “Saturday was really disappointing, but we have to make sure we bounce back tonight. There are ten cup finals to go so the league wasn’t won at the weekend and it wasn’t lost. We’ve got enough in the dressing room to get back on the winning trail. “With Clyde not involved tonight, we have that chance to leapfrog them again so it can all change so quickly again. Peterhead have extended their lead but we’re not giving up on anything. We just need to continue to fight until the end and if we have to go through the play-offs then so be it but our aim is still to win the league. 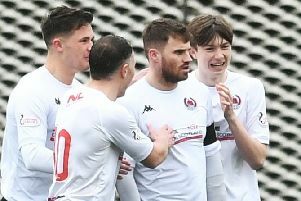 Laird was not the only City representative to express his disappointment at referee Lloyd Wilson’s performance at Broadwood on Saturday after the match official stopping play to send off Clyde defender Tom Lang for a second bookable offence despite winger Graham Taylor finding himself through on goal. However, the former Millwall player says his focus is now on winning football matches. “You can’t blame everything on bad decisions all the time and use it as an excuse,” Laird said. “What we have been good at this season is when we have lost is we’ve managed to bounce back in the next game. There is enough belief in the dressing room.